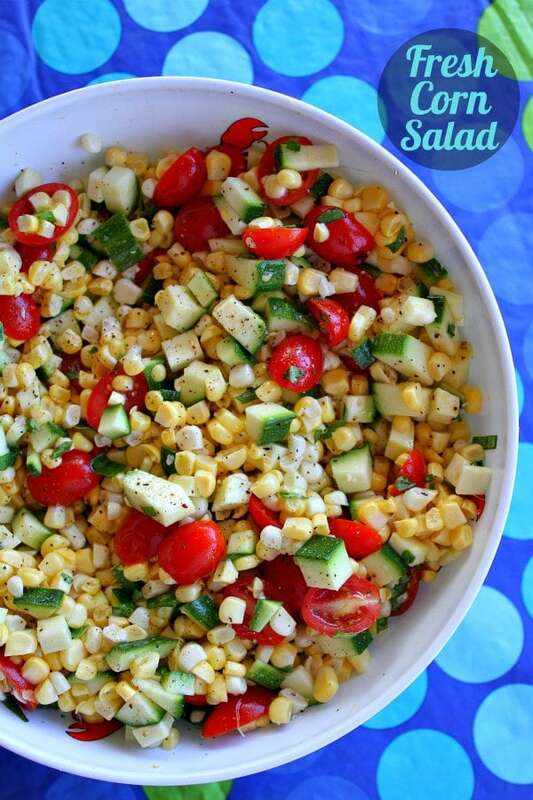 Grab the three best things in your produce section this summer and make this Fresh Corn, Zucchini and Tomato Salad. Watch the video showing you how to make this salad, then scroll to the bottom of this post and print out the recipe so you can make it at home! Do you have any friends on that Raw Food Diet? … that diet where you eat all raw foods with the thought that raw food is better for your body? I have to admit- I couldn’t do it. I cook and bake every day, and I kind of like my food cooked! 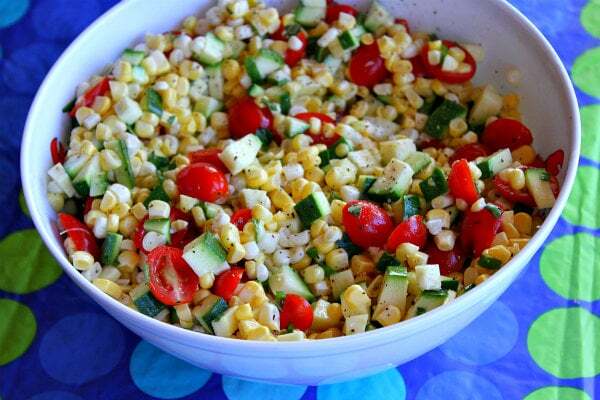 This Fresh Corn, Zucchini and Tomato Salad, however, may please everyone. 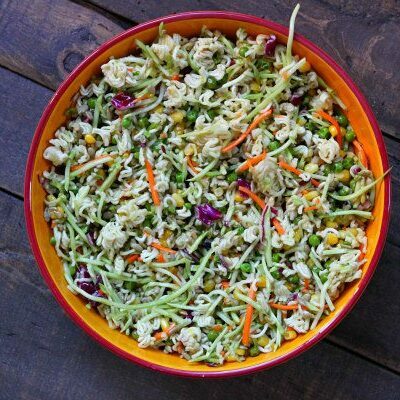 It happens to be an *uncooked* vegetable salad, which is the kind of side dish that you wish for on a hot and humid summer day where the thought of turning on the oven or the stove is pretty unbearable. 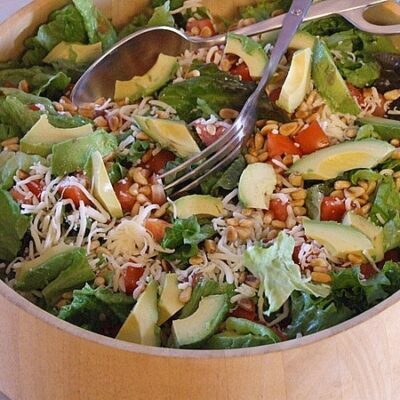 In that beautiful salad bowl above, none of that is cooked. If that sounds weird to you, it shouldn’t. 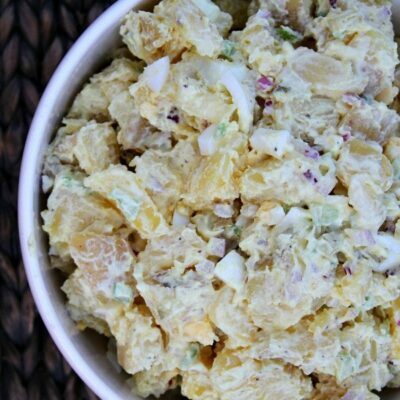 I serve up this salad at summer BBQ’s, and I don’t tell anyone that it’s a raw salad. And guess what? They love it! It all starts with fresh corn. 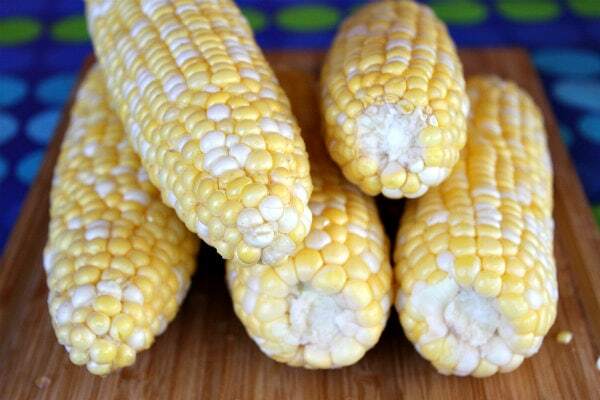 Visit your local Farmer’s Market and find some gorgeous, fresh sweet corn. 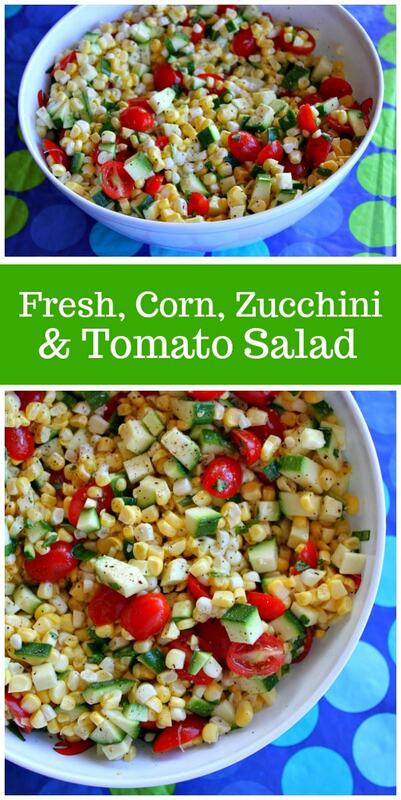 The sweeter and fresher your corn, the better your salad will be. Shuck your corn and rinse it too, getting as many of the silky strings off as you can. Cut the corn off the cob. The best way to do this is to stand it up inside of a deep bowl like this one and use a knife to cut down the sides of the cob. The corn will gather into the bowl. This avoids the big mess you have when you try to cut the corn on a cutting board where corn kernels splatter everywhere! Then add some halved pear or cherry tomatoes. This time of year you can find them multi-colored, and they’ll be fresh and sweet too. And finally, add some slivered fresh basil. Drizzle in a simple, homemade Honey-Lime Vinaigrette and toss. Cover and refrigerate for a couple of hours to let all of the vegetables get nice and chilled and take on the flavors of that vinaigrette. Sprinkle with a generous dose of salt and pepper, and serve! 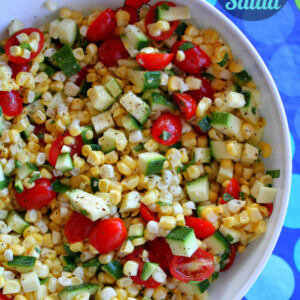 This Fresh Corn, Zucchini and Tomato Salad just so happens to be dairy-free, gluten-free, low-fat and Weight Watcher’s friendly too! See the recipe below for nutritional details. And let me know how you like it! If you’re looking for more summer salad recipes, you might also enjoy my Grilled Corn Salad. Strawberry Avocado Pasta Salad, Broccoli Salad, and Watermelon Strawberry Caprese Salad are delicious summer salad recipes too! 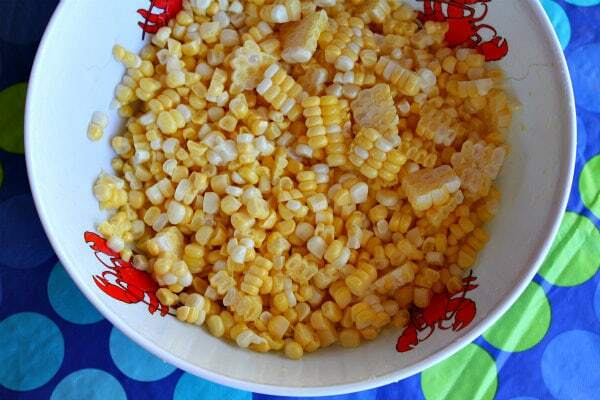 This is the best, fresh corn summer salad recipe! Cut the corn off the cob by placing it upright in a deep bowl, and cut down the sides of the cob with a sharp knife. 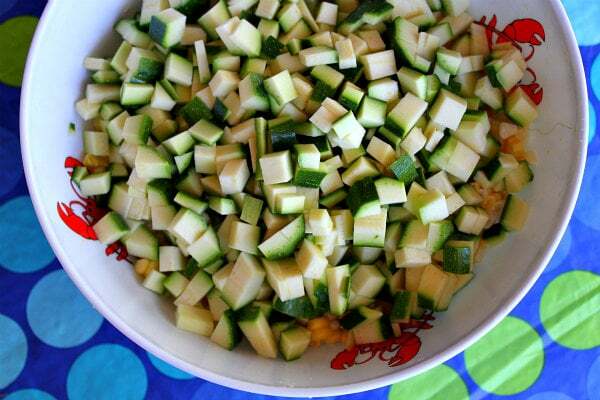 Dice the zucchini into 1/2-inch pieces (leave the skin on) and add it to the bowl. Add the tomatoes, and stir to combine. In a separate small bowl, whisk together the vinegar, olive oil, honey and lime juice. 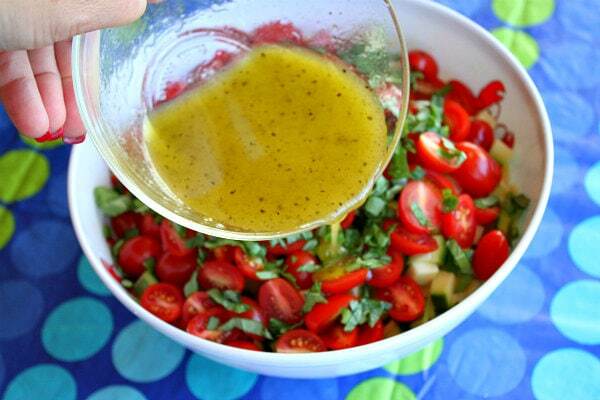 Pour the vinaigrette over the salad and toss to combine. Garnish with fresh basil. Cover the salad with plastic wrap and refrigerate for at least one hour and up to 4 hours until ready to serve. Toss again before serving to re-distribute the dressing. Add salt and freshly ground black pepper just before serving. This recipe was originally published in 2012. It was edited and re-published in 2018. I pick your salad out of a lot other corn salads just because of how simple it looked. Can’t wait to try it. Delicious, we loved it. I had to use a red pepper in place of the tomatoes, but it worked out great! Awesome recipe you have there. I’m not a fan of veggies but this one looks really interesting and delicious! That is the exact kind of recipe that I have been looking for….a healthy fresh adn seasonal side. I am saving it for our next BBQ. Thanks for sharing it! made this tonight, wasn’t sure if i would like the raw zucchini and i LOVED IT. Great one! Made this last night for a big BBQ party. It was amazing! 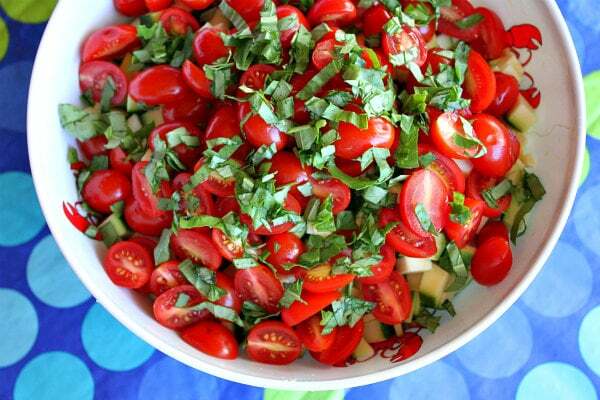 This is going into my summer salads standard rotation! So fresh and so flavorful. I just made this for my weekly salad club and everyone loved it. Thanks, Lori! Loved it, but made one teeny change. Since tomato season is so short in Minnesota, we take extra care of them! 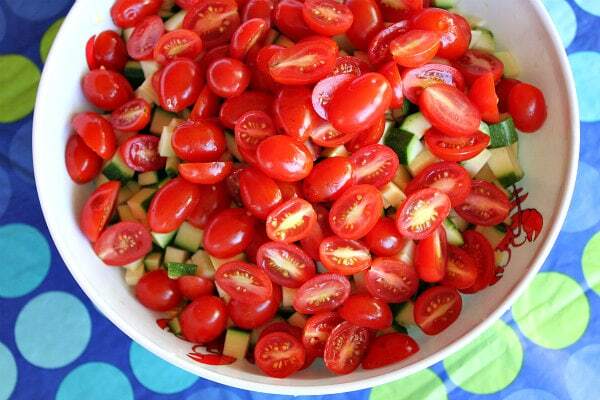 Refrigerating reduces the flavor of tomatoes. So, I added the tomatoes just before serving. Otherwise, followed your recipe. Really delicious! Healthy, colorful, pretty and gluten free. That’s for me! This recipe is the absolute picture of “summer on a plate!” Good and good for you…thanks as always! i don’t think I could last more than one day on a raw diet. 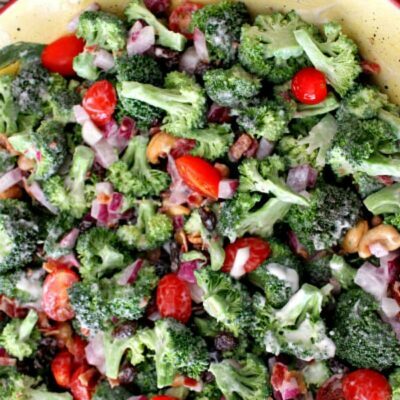 I love to bake and eat the results but when it comes to summer dinners all I want is a fresh veggie salad, just like this one. Wonderful combo of flavors and color. I will definitely be making this- simple and delicious! This would be perfect for our upcoming block party! Love how simple it is and that it doesn’t require me to heat up the kitchen! ooh i love all the bright colors! yum! I am eating this as I type! So delicious and it fits in with my diet! Basil and zucchini fresh from the garden makes it extra delicious! I am also making your greek salad cucumber bites tonight for a girls night out! I wanted to make something that did not require turning on the oven and that recipe looks to be a hit! All of my favorite things wrapped up into one delicious bite!! Thank you for sharing your wonderful recipes! !